I want to ask for experiences pressure testing fostapex. I am required to do a 100psi hydrostatic test of a system with about 500 feet of fostapex. We charged up the system and saw pressure loss of about 5-8 psi in 1/2 hour. Found a couple weeping threaded connections consisting of very small amounts of water—like so small you hard to touch the fitting and see if the tiniest bit of moisture was on your fingers. One leak was at the factory installed air eliminator on the manifold. One thing I noticed is that pressure loss was greater the first round and continuously decreased to the point I’m now seeing 1.5psi loss in 1/2 hour. I saw on the fostapex manual that they consider 8psi loss/hour a successful test. I’m assuming there’s some expansion factor. One other possible culprit is that I inverted my Caleffi manifold which means the end cap is a bit away from the body of the manifold. Caleffi says it should not leak, I see no moisture anywhere but maybe it’s leaking so slowly I can’t see it? My question is should I be able to stabilize at 100 psi with no loss for a half hour? If so, how long do I need to pressurize it to get all the expansion worked out? Or is no pressure loss just not in the cards with Fostapex? Again, it’s a hydrostatic test so no air. water pressure test? The water is going to change volume with temperature. Should stabilize once a consistent temp is reached. The Caleffi manifolds have hygroscopic caps on the air vents, S&R, be sure you use the black plastic test caps that ship to get a tight seal for the pressure test. What seals the end caps to the manifold when they are backed off 1/2 a turn to invert the air vent and drain in order to flip the manifold? I never understood why that didn’t cause a leak. Temperature change might be the culprit. I turned off the system around 5am or so. It was a cool rainy day, so no appreciable solar gain. If the water cooled consistently over the course of the day it would explain the greater loss in the morning versus evening. I should check and see how long it takes the water temperature in the system to reach ambient temps. And schedule my inspection for a very sunny day. Or is the cap tightened the extra 1/2 turn I'll check with assembly tomorrow on how they make the inverted versions. I know every manifold is assembled and pressure tested to 100 psi in Milwaukee. How much pressure loss do you see with temperature changes? Say if temperature drops 10* F, would you see 5-10 PSI loss in ~ 10 gallon system? I'm only working with the return side of the manifold at the time being, and I am pretty sure it's leak free. I pumped it to 100psi with air and got it to stabilize for over an hour at that pressure. But when I pump it up with water to 100 psi (just the manifold, mind you, so very small amount of water), I'm still losing pressure at 1-2psi/10 mins after several rounds of recharging it. Could it be air dissolving and temperature dropping combined? If it holds 100 psi air for an hour? It should hold water at that pressure also. When you fill with water, unless you purge, there will be some air in the tube also. Water pressure doesn't drop to zero, or I haven't let it sit long enough to find out (had to turn the heat back on with 32* weather yesterday). But yes, the air seemed to stabilize but I cannot get the water to stabilize. What’s the temp of fill water. What’s the temp of the space the tube is in? If the fill water is warmer than the space once filled as it cools it will lose volume. You would all most need to let water equalize to ambient temp of the space it occupies, Then look for a drop in pressure. So what I’m trying to say is if you had 50* fill water, and the space was 40 degrees you would lose some pressure from less volume once the water reaches 40* temp. So if you fill to 100 psi, and drop to 85 but no more. I wouldn’t worry about it. It’s equalized in temperature. With regard to inverting the Caleffi manifolds--the end cap should NOT be backed off a half turn. The correct procedure is to swap the position of the drain valve and the air vent fittings. This was the official answer from Caleffi when I asked. Fyi, each fitting uses a different type of loctite. I followed their procedure to a T and have had no issues. If you search their website on "what is an inverted manifold" you will see my question about halfway down the comment section. Attached is a picture of what loctite to use. Thanks Gordy. I am letting it sit now to see where I can get it to equalize. The problem is the inspector wants to see 100 psi with "no discernible loss in pressure." So I need it to equalize around there. Thanks RxRoy. I saw that thread---the comments also suggest you might be able to back it off half a turn with no leaks. In any event, I have loctite and am going to do it right now to ensure no leaks. But I don't think it's currently leaking at that joint---no bubbles with soapy water under an air test. Just got the final inspection on this. I never really figured out what on the manifold was losing pressure. I did find a couple of very slow leaks on two circuits, which I addressed. 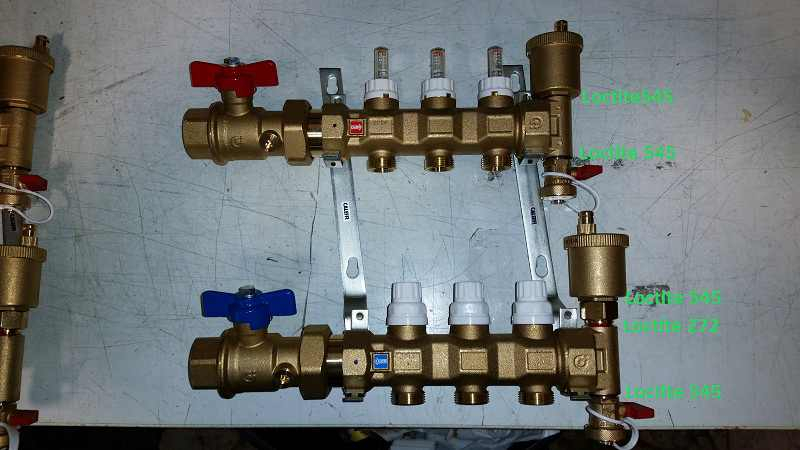 Once that was done, I got pressure to hold by leaving the isolation valves on the manifold open and isolating the boiler using other valves. It held indefinitely at 100 psi on a hydrostatic test. Pretty sure there is one or more slow leaks in the manifold valves at excessive pressure, but since I'll never have to pump it to 100 psi again, I don't think they will matter.